�����Recently, Heritage Auctions sold the 1880 $4 Gold Coiled Hair Stella at Central States. This coin was certified by NGC as PR67 and it also had been approved by CAC. With no recent transactions, this coin showed an FMV of $1,281,250 with a CAC value of $1,470,000. Yet, the coin realized $1,821,250. The updated CAC value is now $1,900,000. When there are multiple buyers for rare coins that have not changed hands for long periods of time, prices can change dramatically. 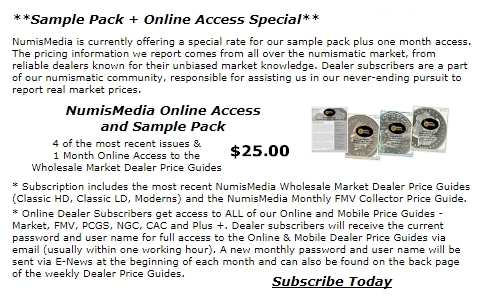 �����But not every collector has the reserve assets to compete in this high-value arena. So how can one identify sleepers in today�s numismatic atmosphere? Surprisingly, it is not that difficult to find coins that fall into the sleeper category. With all the historical data available, along with population reports listing how many coins are certified in every grade, the task becomes much simpler. �����The Barber Quarter series is filled with prospective sleepers. The FMV for a complete set of Barber Quarters in MS64 was $184,370 in January 2007, and today that same set is at $209,985. But before you embark on a quest to build your own complete set of MS64 Barber Quarters, you might want to note that there are only nine coins certified for the 1901 S in MS64, so there are potentially only nine complete sets possible. �����Looking at the populations of Barber Quarters, the MS64 grade is the cut off where most of the dates start to become elusive. The 1892 has one of the highest populations at 688, combined PCGS and NGC, for the MS64 grade. The 1901 S is the lowest with just nine coins in the MS64 grade, and has only 19 coins grading higher with the highest being MS67 with three coins certified. Below are the three highest valued Barber Quarters along with their populations in the highest grade available. �����Obviously these three coins are not sleepers. They are the most difficult to acquire and have the highest values. But looking at the population reports, there are many others that have low populations in MS64 and higher grades. To fall into the sleeper category, a coin should have a low population and a relatively low current FMV in comparison to other rare dates within this series. �����Take for example the 1895 O and 1896 O in MS65. The 1895 O in MS65 has a total of 19 coins certified combined from both services. The 1896 O has 16 coins certified in MS65. The 1895 O has 11 graded higher and the 1896 O has 10 higher. However, the FMV for the 1895 O in MS65 is $2,660, while the FMV for the 1896 O in the same grade is much higher at $7,690. �����Can the difference of three more certified coins represent this much of a disparity in the Fair Market Value? Of course it can, but the ratio in this comparison would seem to be way off. Also accounting for the difference in FMV is the fact that the 1896 O had an original mintage of half of the 1895 O. But the population reports are designed to account for the current potential availability of various dates and grades. Below are a few more examples that also look to fit the qualifications of a sleeper. �����Another approach advanced collectors can use to find sleepers is to compare the number of coins certified in a specific grade to the number of coins with a CAC sticker. This will refine the search even further as very few of the coins listed above include a large number of CAC coins. �����The current Population Report for CAC shows no coins approved for the specified grades for the 1895 S, and there are only 35 coins total with the CAC sticker on the coins listed. The 1894 O has five MS65�s with the CAC sticker and six in MS66. CAC lists four coins approved for the 1895 O in MS66 and higher, while the 1897 O lists five coins in MS66. �����There are just over 1,000 coins with the CAC sticker in MS65 and higher grades for all Barber Quarters. The 1892 and 1916 D are by far the most common dates with the CAC sticker and easily make up the largest percentage of all dates approved in MS65 and higher. Most of the rest of the dates have a population of 10 or less, especially for the dates prior to 1900. �����The coins we have listed are just a starting point in the search for sleepers in the Barber Quarter series. Using the methods above, you too can find more sleepers in this series and others.